For people who grow up with them, nothing quite says summer like a bucket of steamed clams. I'll suggest, however, that these spicy steamed clams are even more of a treat. 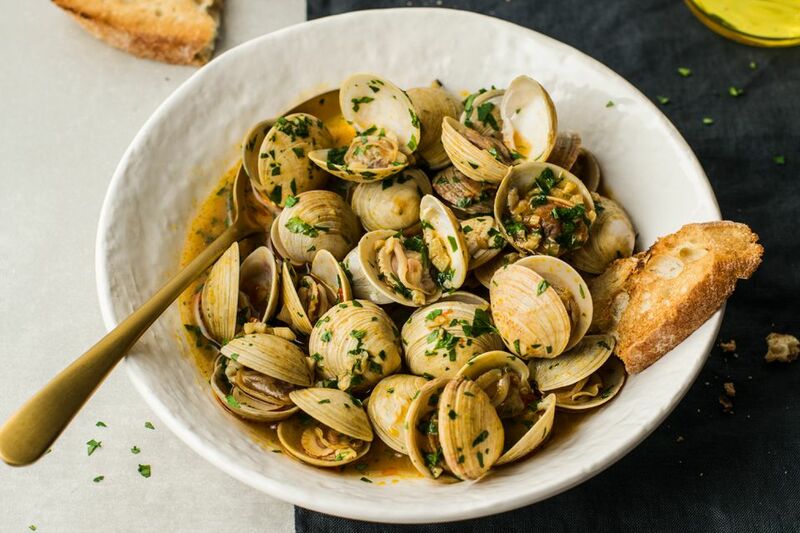 A bit of white wine, a tablespoon or two of tomato paste, some garlic, and red pepper flakes transform simple clams into a spectacular dish. Tomato conserva is a wonderful additive to this dish, but regular tomato paste works just dandy, too. Pick over the clams and rinse them free of grit. Set them aside. In a large pot, heat the olive oil over medium-high heat. Add the garlic and cook, stirring, until it just starts to turn barely golden. Add the pepper flakes and stir to combine with the garlic. Then add the tomato paste. Cook, stirring to work the tomato paste into the oil, for a minute or two. Reduce to a simmer until the wine is reduced by a third and stops smelling quite so boozy. This will take about 10 minutes. This is an important step because while you want the acidity and flavor from the wine, you don't want the alcohol or alcohol taste in it. Cooking the wine and reducing it before adding the clams makes sure the focus is on the delicious clams, not a weirdly hot boozy flavor. Add the clams, cover, and cook until the clams open and are cooked through - about 3 to 5 minutes. Always look for fresh clams—they should close right up the second you touch them. If you need to store the clams, put them in a colander over a large bowl and cover with a damp towel to keep them both moist and out of standing water. If you have wild-harvested clams, you'll need to purge them: put them in a bowl and cover with water. Let sit 20 minutes; they'll spit out the sand they contain. Some people add cornmeal to the water to encourage the clams to take that in and purge out the sand. Note that if you buy farm-raised clams, they will come already purged so that you can skip the purging.